A brand new holiday pet! And this one is super cool and useful as a battler. Be still my beating heart! Oh. Yeah, that is kind of an insensitive turn of phrase to use here. 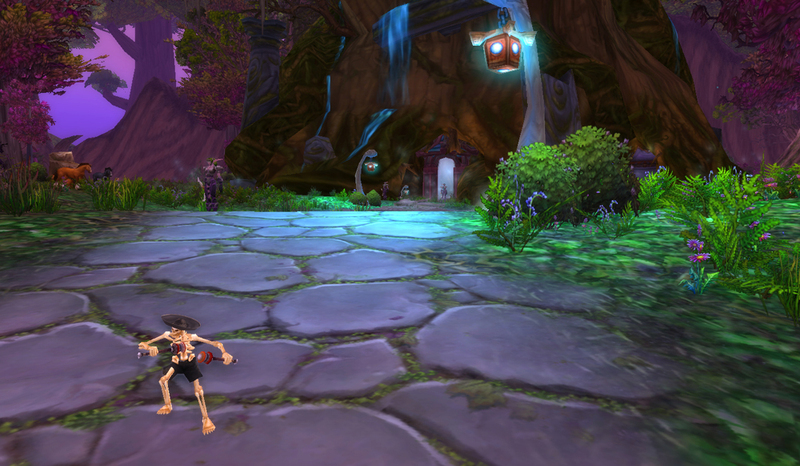 The reason it looks like it’s waving in that screenshot is because it also does the Undead headbanging dance. 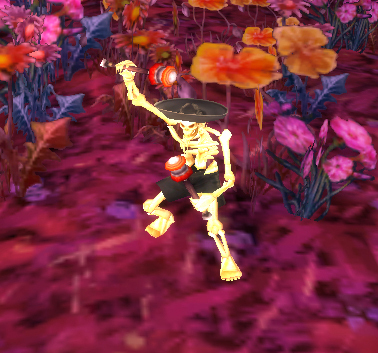 When I was fooling around with it on PTR, any time we stopped moving, it started dancing with its wee little maracas. It also dances through battles when it’s not performing an action. I wasn’t lying when I said it’s cool. So, what’s the catch? Its quest is only available for two days a year. The Macabre Marionette is available as a part of the Day Of The Dead festival, loosely based on the Mexican holiday Día de Muertos, but previously it wasn’t a companion pet per se. It was an unlearnable item in your bags which spawned this little dude, like the very old school companion pets. It disappeared once the two-day festival was over. It looks like Blizzard changed their mind for this year, and the Marionette will be trainable as a battle pet at long last. In order to see the spirits and obtain the Marionette, you have to go to the graveyard of the city where your racial quartermaster is. This is especially confusing for Worgen, whose leader hangs out doing nothing in Stormwind while their ‘home’ tree thinger and quartermaster is in Darnassus. Most other races are relatively straightforward. Trolls, Orcs & Goblins go to Orgrimmar, Gnomes and Dwarves go to Ironforge, etc. The graveyards in Dalaran and Shattrath allow all comers, too. Before you leave the city for the graveyard, you should grab at least one Simple Flour and one Ice Cold Milk. 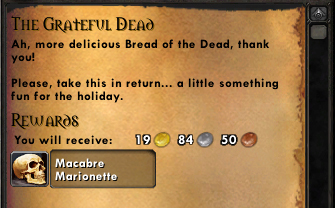 The quest objective is a Bread Of The Dead, the recipe for which is obtained in the graveyard for 20s. Note that you can only cook the bread over a special blue campfire located directly near the vendor. The other catch is that in order to see the quest NPC at all, you have to use a Marigold. Marigolds are cheap, but have an extremely short duration. 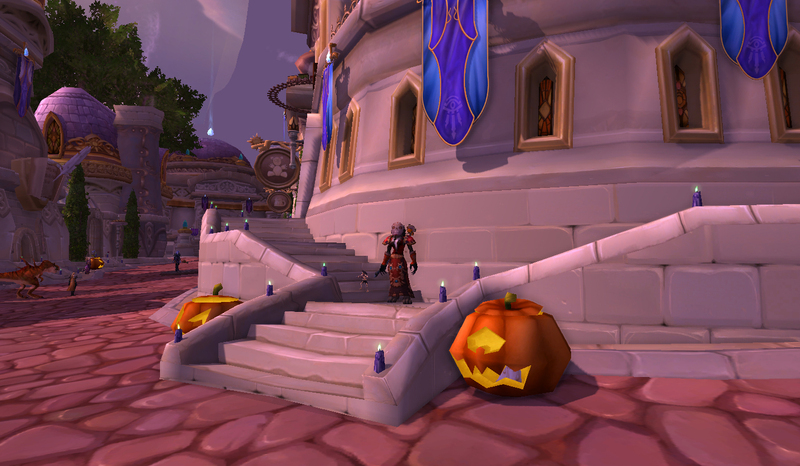 You can repeat the quest multiple times on the same account during the holiday, and can do it with any level character, but you cannot do quests in multiple locations (eg, going from the Worgen spirit in Darnassus to the Dalaran spirit). It’s really not much of a hoop to jump through, but it had best not be for such a tiny window of acquisition. Though, luckily, it is tradeable, so if you repeat the quest a few times on a few characters you may be able to make a quick handful of gold in a month or two. The pet’s revamp into a battler is very interesting. Note that it starts off Uncommon, so it’ll require a stone. 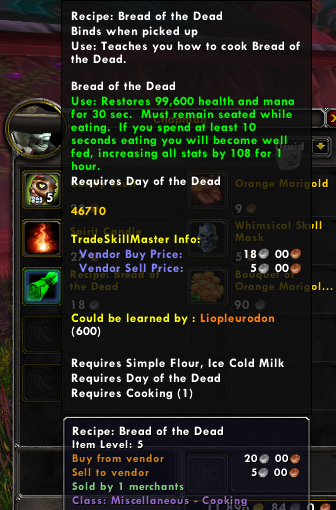 It has a few old abilities–siphon life/death & decay in the second slot is a fairly common Undead MO, and Bone Bite has shown up in the past as well. It has the new Macabre Maraca, a 100% accuracy humanoid nuke, which makes me want to try pitting the Marionette against Yu’la. It has Bone Barrage, an ability similar to the critter Nut Barrage, only undead. Lastly, also very interestingly, it has Dead Man’s Party, which is similar to Flock. The reason I find this moveset interesting is because, not only will it make it a terror against dragonkin, but it seems like Blizzard has been making pets with a moveset similar to this recently. There have always been Swarm-ers, Flock-ers and Stampede-ers, featuring Critter, Flying and Beast damage respectively, but Lil Bling was just added with a mechanical version of this ability, and now this pet for the undead version. Undead and Mechanical are rather under-represented caught pets, and this brand of move is such a good one for PVE synergy it makes me curious for the future. What new pets are coming, and what new fights are being planned for the next expansion? I’d be willing to bet some imaginary money that we see either some kind of Torrential Downpour ability like this from caught Aquatics next expansion, or maybe a Sonorous Frog Croak akin to Howl. But, ultimately, Day Of The Dead is about remembrance. For Gilneas! Or for that weird tree thing, I guess. This entry was posted in pet profile and tagged auctionable, holiday, quested, undead on October 25, 2013 by Liopleurodon. Great post. I look forward to collecting one soon. Thanks! He should clean up against the Critter Beasts of Fable/solo pets really well in the future, too, which is why I’m verrrry curious as to what’s coming. I’ve been debating how to use it. It would be incredible as a 3rd on a Lightning team, or really as a supplement to just about any good 2-pet combo. I’m definitely grinding it to cap ASAP. Thanks for the review! I look forward to getting mine.